When Elmo gets his furry fingers on Abby Cadabby’s magic wand, there’s something in the air – and Sesame Street becomes a nonstop, all-singing, all-dancing musical montage! Grover and Baby Bear sing their highs and lows, Cookie Monster sings fast and slow, Bert and Ernie converse in song and Murray makes mouth music for all to sing along! Learn why it feels good to sing a song, but why it feels good to stop, too! What will Elmo learn about the power of musical magic? Join the conga line of fun to find out! Come and play BEFORE the show! Play Zone at Sesame Street Live is a fun way for children to experience their favorite street! Sing and dance with Sesame Street friends, sit in Big Bird’s nest, twirl in Zoe’s dance studio, sit on the steps of123 Sesame Street, and much more. You won’t want to miss a single picture-perfect moment! Hosted byMurray, Play Zone opens one hour before the show – best of all, Play Zone is FREE with your Sesame Street Live ticket! Tickets on-sale NOW at the box office and online at www.axs.com. Ticket prices: $16, $22, $28, $35 (Gold Circle) & $65 (Sunny Seats). *Opening Night (Thursday, February 21, 7:00 PM)—All seats $12 (excluding Gold Circle and Sunny Seats). Get the ultimate fan experience with Sunny Seats! Sunny Seats include VIP seating, a Meet & Greet with Elmo and another Sesame Street Live character before the show, plus access to the Sesame Street Live Play Zone before the general public! 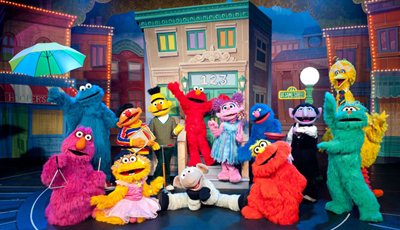 Do you want to win 4 tickets to see Sesame Street Live? To enter this contest, do at least ONE of the following actions and leave a comment below to tell us who your child’s favorite Sesame Street character is. ALSO tell us which action you completed and paste a link to wherever you shared about this contest. The number of entries = the number of actions completed. So if you do 2, you get 2 entries into the giveaway, and so on, up to a maximum of 4 entries per person. Must be at least 18 years of age to enter. 3. Follow North Texas Kids on Facebook. Share about this contest on your Facebook page. Be sure to share it as a public post so we can see it on our timeline. Just click on the Facebook icon below this post. Contest ends Friday, January 18th. Winner will be notified by email. The email address you use in your comment below is the one we’ll use to notify you. My child likes elmo and zoe oh yeah snuffy. I liked facebook I pinned to pinterest I am already receiving newsletter. My daughter LOVES Abby. I follow you on Facebook and by email. I subscribed to your eNews. You are totally on my fb timeline! Despite my attempt to sway her towards my favorite GROVER, her favorite is probably Elmo! I am sharing this contest on Pinterest. My boys favorite characters are Elmo and Rosita! And signed up for the news letter. Both of my kids love Grover! WINNER ANNOUNCEMENT for our Sesame Street Live: Can’t Stop Singing giveaway: Congratulations to Melissa T. Enjoy the show! Thanks for participating everyone! To purchase tickets, visit http://www.axs.com. Use code ERNIE to get $3 off each ticket.